Submitted by Raphael Pulgar on Apr. 15, 2019. First published on Aug. 10, 2017 and last updated on Apr. 16, 2019 by Raphael Pulgar with contributions from Denise Azucena. For the modern electronic musician, performing goes beyond playing keyboard MIDI controllers and tweaking knobs. Songs arranged in the studio can now be performed and altered live using software like Ableton Live and NI Maschine. Sounds, samples or even entire sections of music can be triggered with the help of dedicated MIDI pad controllers assigned to specific functions in a DAW. This 2019 update of our selections brings in new entries from Native Instruments as well as consistent favorites from Arturia, Akai, Novation and Ableton. The Arturia Beatstep is a compact, general purpose USB MIDI controller that also functions as a standalone sequencer and percussion controller. The assignable velocity sensitive pads are great for expressive performances while its encoder knobs allow real-time virtual instrument control by assignment. 16 customizable presets can be stored and recalled easily with the touch of the recall button. Dimensions: 15.75" x 7.1" x 2.44"
Despite it being value priced, the Beatstep is surprisingly feature rich and many reviewers are all praises for its versatility, build quality for the price and compatibility with their setups. It has gathered a lot of praise from virtual instrumentalists, digital synth performers and analog junkies as more than just a plaything. Many consider it to be a serious and almost indispensable addition to their rigs. People in reviews note some issues with the turning range of the knobs indicating they aren't sensitive enough and need more turns than usual to reach their desired value. Being a minimalist device, others wished it had a screen to at least see numerical values or patterns. Whether it's your first rodeo or you're a veteran in search of a portable controller that you could use with both old-school analog equipment, digital variants and virtual instruments, the Arturia Beatstep is a no-frills, easily accessible solution. 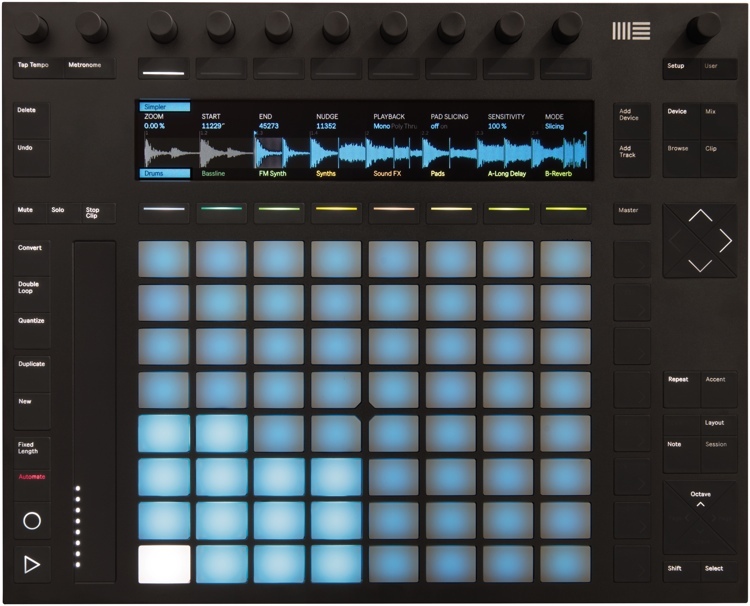 The MK3 edition of the Maschine Mikro caused a stir when it was announced in September 2018. Forums lit up at the prospect of a sub-$300 Maschine controller. The Mikro MK3 lived up to the hype at release, bringing in a plethora of features like a new smart strip to control pitch, modulation, effects and even be able to "strum" held down notes as chords like a vintage Suzuki Omnichord. Dimensions: 12.6" x 6.96" x 1.77"
Reviewers were surprised to see that the Mikro Mk3 is positioned at a lower price point than its predecessor. This made it more accessible to those who have been wanting to enter the Maschine workflow but were put off by the high barrier to entry. A few users disliked the smaller screen since most of them were upgrading from the Mikro MK2. The Mk2 has a much larger screen and they had to take some time getting used to looking more to their computer screens than the hardware. This also means that editing samples is not possible without looking at your computer screen. Since the Mikro MK3 only has one encoder knob, some noted that they found having to press arrow keys to get to the parameter they want to tweak a bit cumbersome. If your primary goal is to be able to use Native Intruments' Maschine software and want an affordable matching hardware controller, The Mikro MK3 is a great entry into the workflow. Do bear in mind what gets cut out from its larger siblings. If you don't mind the features excluded, then the Mikro MK3 is your best option. While being around the same price point as the NI Maschine Mikro MK3, the Maschine Jam is not an "upgrade". Rather, It offers a different workflow and feature set that caters to performance, live looping and on-the-fly improvisation. Dimensions: 12.6" x 11.6" x 1.2"
For people who have never had experience with the Maschine lineup, there can be some confusion as to which device fits best to their needs. 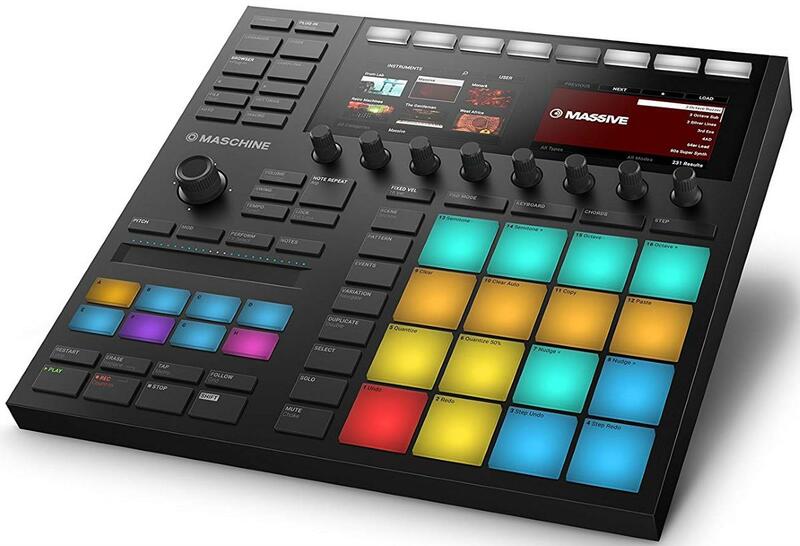 Upon research, users who favor the Maschine Jam say they prefer the controls for their live performances. 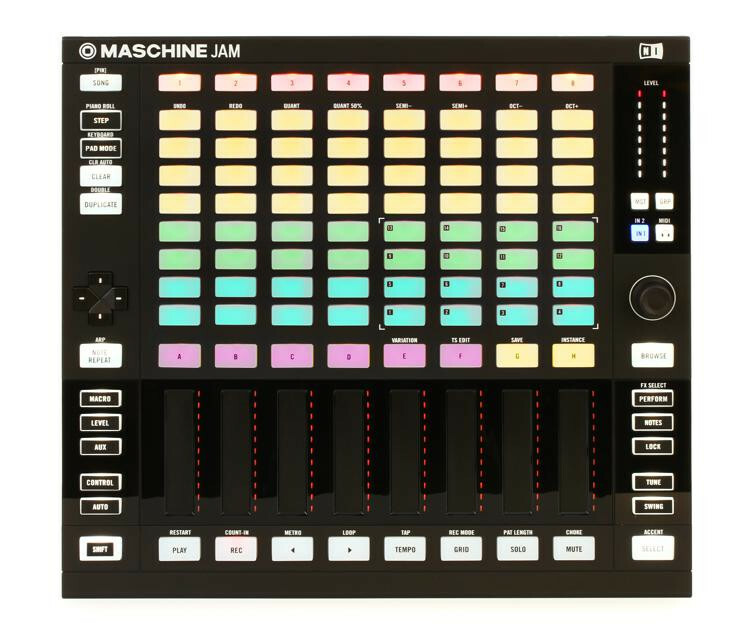 One common comment is how fun and refreshing it is to make music with the Maschine Jam thanks to its intuitive layout. Not too many complaints however users criticized the lack of velocity sensitivity on the pads. The Maschine Jam is a great piece of kit that makes you want to use it like an instrument rather than a controller. This is a desirable quality in products of this sort as finding the right balance of intuitiveness and features usually sways in one direction or the other resulting in either something simplistic and uninspiring or complex and frustrating. The Maschine Jam manages to find that right balance between the two. If you can live without velocity sensitive pads, the Maschine Jam may be the right choice for your needs. In 2009, Akai, in collaboration with the creators of Ableton Live, developed a hardware controller called the "Ableton Performance Controller" or better known as the APC40. It was a piece of hardware designed with controlling the functions of software like Ableton Live with live performances in mind. The APC40 MKII is not just an updated APC40 but a total rework in a more compact footprint. Other enhanced features include RGB clip-launching grid, reinforced fader design, and a revised knob lay out. The nine reinforced faders provide control over volume, pan and other parameters, while the eight channel control knobs provide visual feedback and let you easily access control options. Dimensions: 16.7" x 10" x 1.8"
Users appreciate the pads' LED color lighting, and how they reflect the Ableton session view. This helps users get immediate performance feedback when it comes to triggering clips, mixer, or FX processing without looking at the screen. In his Sound on Sound review, Simon Sherbourne said both performers and composers will appreciate this controller because of its user mode where you can utilize the user button to switch "the pots to generic MIDI controllers, allowing you to use Live’s MIDI Map mode to take control of any parameter. " Some users noted the inherently flimsy and toy-like feel of the plastic parts and question its long-term durability. Other downsides a few users found were the pads lack of velocity response. Velocities had to be tweaked in the DAW for more nuance. For people who use other DAWs, manual mapping of the trigger pads is required. If you're a purely an Ableton Live user, The APC40 MKII pairs great with the DAW as it was designed with that specific purpose in mind. You may need additional setup if you wish to integrate the controller with other software. The Launchpad Pro goes several steps beyond its predecessors. New features include RGB pad lighting, velocity and pressure sensitive pads with aftertouch, expanded note modes for virtual instruments with custom scales where it mutes notes outside the scales you set to prevent off notes and more. It has MIDI I/O for use as a grid based controller for other midi instruments outside Ableton. Dimensions: 10.3" x 1.1" x 10.3"
The design lends itself well for integration with Ableton Live. Users noticed hassle-free integration with other software as well. The RGB lighting of the pads are a welcome upgrade from its predecessor and enables color matching to active Ableton clips for better visual feedback. Despite its lack of faders, users note the velocity sensitive fades were very easy to use. Seasoned pros appreciate the depth of customization as well because of the open source nature of the product's firmware. This makes it easy to "hack" and put in additional features that aren't available out of the box. These are curated by several active online communities dedicated to expanding the usage of the Launchpad Pro. In his MusicRadar review, Si Truss mentioned the design's "combination of metal chassis with rubberised outer coating means that the Launchpad Pro is plenty sturdy and feels like it could happily take a regular beating on stage. The RGB buttons look very striking too, and provide clear visual feedback under all lighting conditions." While more of a caveat than a con, several unsatisfied customers note that the Launchpad Pro has a steep learning curve. 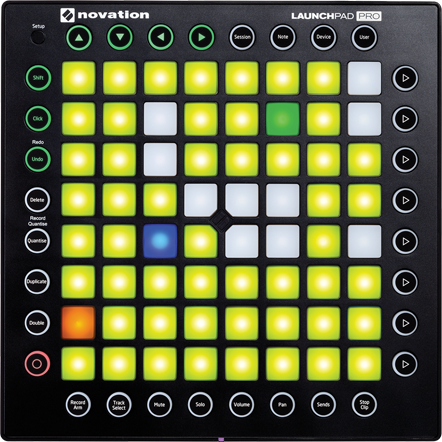 True to Novation's spiel of "Play it like an instrument", forum users note that the Launchpad Pro demands to be learned as such rather than as collection of pads to hit. Using the device takes practice especially during live performances and it's easy to miss a hit or press the wrong pad to trigger the wrong clip because of the tightness of the layout. If you're looking for a MIDI Pad Controller to upgrade your existing rig with additional features, workflow and performance options, the Launchpad Pro is your best bet. If this is your first controller, it may take time getting used to the workflow especially if you aren't an Ableton live user, but once you're over the learning curve, the creative freedom and expression it allows can be very satisfying. Native Instruments went back to the lab again to develop their MK3 of their flagship MIDI Pad Controller and Software, Maschine. Major improvements over the previous iteration include a completely redone front end with bigger pads, a screen and a hi resolution interface. New I/O features include balanced stereo inputs and outputs, Midi in and out, a microphone input with gain control, headphone output with gain control. Dimensions: 12.6" x 11.85" x 1.61"
The Maschine Mk3 receives general praise from users for it's updated workflow and playability. The resized pads and positioning of various functions make them easy to reach especially during live performances. Several people found the controller "Inspiring" and say it feels like you're playing a musical instrument instead of a piece of MIDI hardware. Some users disliked the fact that additional sound packs have to be purchased separately given the price of the controller. Some people claimed to have gotten an "open box" unit that is unable to be registered. For this, the community suggests only buying from trusted retailers. While it has a mic in and functions as an audio interface, several reviewers felt like an XLR in with phantom power would have been better. 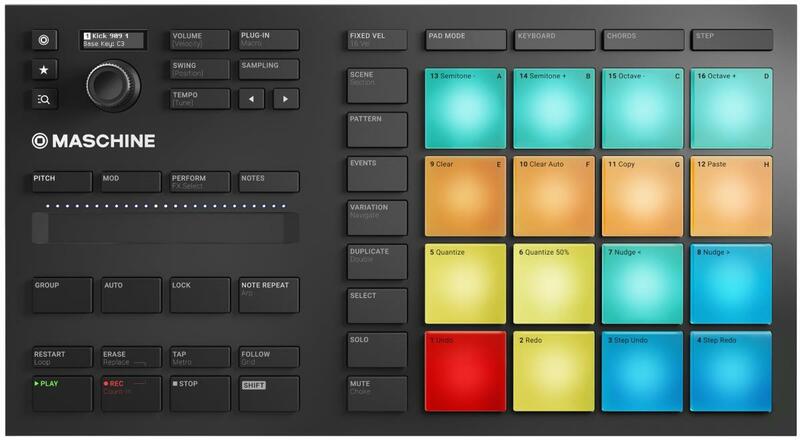 Native Instruments' Maschine is an ecosystem of hardware components and software. the MK3 version of the controller brings a lot to the table and integrates well with other hardware pieces you may already own. If you primarily produce using software from the Native Intruments catalog, the Maschine MK3 is the flagship. 92 out of 100. Incorporating 225+ ratings and reviews. The Push 2 is unique in a sense that it is a hardware controller designed by Ableton to work with their Live DAW. Its 64 velocity sensitive pads enable both playing in real time, step sequencing, and adjusting loop lengths, which makes the controller suitable for both live performances and studio use. The pads also act similar to a MIDI keyboard where its multi-color lighting shows key intervals and scales. As an upgrade of the Push 1, it showcases a bright, full-color, high-resolution screen display that lets you zoom in on specific details for warping and slicing samples. It also includes a touch strip for pitch or modulation effect control. Dimensions: 14.88" x 11.96" x 1.65"
While designed specifically for use with Ableton's software, reviewers note that the Push 2 was just as easy to integrate with other gear like turnables, step sequencers and other outboard gear. Users note that the Push 2 is their standard for MIDI controllers especially for Ableton Live users. Many found it to be intuitive when it comes to step sequencing and programming synthesizers. In his Sound on Sound review, Nick Rothwell mentioned "the graphic display presents a lot more information at a glance, the display buttons contribute to a streamlined and flexible user experience, and the waveform visualisations open up a new world of audio improvisation and experimentation." There is very little to list in terms of cons that don't fall under user error, failure from wear and tear where a unit has functioned fine for 2 years before it stopped working and compatibility issues with computers. The learning curve is reported to be quite steep as well and people who are new to using controller pads should be ready for it or start with a simpler device. The Ableton Push is a top-of-the-line MIDI Pad Controller that does just about everything you want while being able to integrate into any rig as an accessory or centerpiece. While it does come with a steep learning curve associated with the complexity and range of features that it offers, users patient enough to learn its every function will be in for a rewarding experience. 85 out of 100. Incorporating 300+ ratings and reviews. 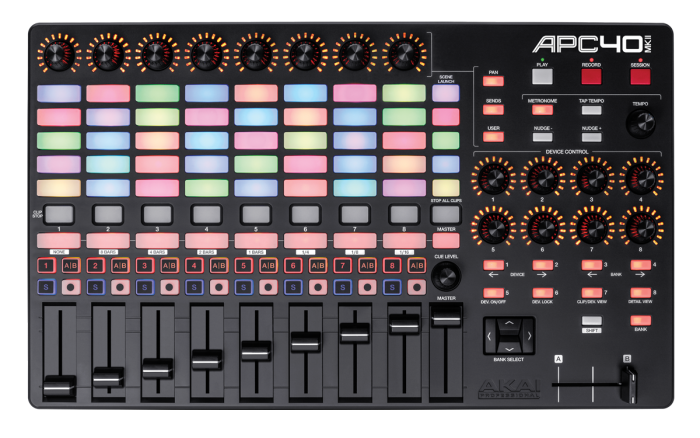 The APC Mini earned a spot as an honorable mention in this list due to its status as a gateway MIDI Pad Controller for use with DAWs like Ableton. 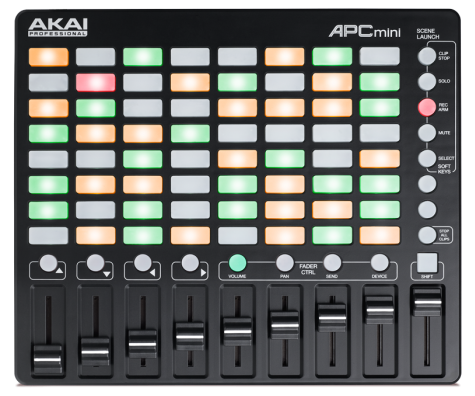 In 2014, Akai released the APC Mini as the compact version of their APC40 MKII. The 8x8 multi-color grid is used to launch clips and samples while providing visual feedback for live performance or remixing. Tracks can be mixed with its dedicated channel faders, volume, pan, sends, and device control. It's also compatible with most devices and is pre-mapped to Ableton Live once plugged into a computer. Reviewers praised this controller for its compact design and ease of use. Most of them found it easy to set-up with straightforward controls. The simple design allows for more manageable learning curve for people new to Ableton Live. Several people noted that it gives them a smooth transition between composing, arranging and performing. While it automaps its buttons in Ableton, tweakers love the ability to easily reassign buttons and knobs. Some Ableton users are bothered by its lack of session overview, which lets you navigate through your Live set quickly on Ableton without viewing the computer screen. A few note that it works best with Ableton and not many other DAWS. Most low scores were from durability and the availability of software downloads. If your DAW of choice is Ableton Live and feel it's a bit too early to spend higher for more advanced controllers, the APC Mini is a great choice on a budget with its Ableton-specific feature set. If you're looking to use other DAWs, it might take a little bit of mapping and tweaks under the hood. Pads on most good controllers are velocity sensitive, for additional control look for ones that are also pressure sensitive - this allows for the same kind of expressiveness you get from keyboards with aftertouch. For additional performance feedback also look for controllers with back lit pads. Ideally, you want your controller to feel like an extension of your DAW. This makes your workflow more productive when you don't have to reach for your computer mouse or look at your computer screen too often. Most MIDI pad controllers come with buttons that have transport, tempo and other control/navigation functions. Some controllers also have knobs and faders for controlling effects and parameters of the mixer on your DAW in real-time. Most controllers operate via USB bus power. This may be a concern when it comes to draining your device's battery. Some controllers have adapters for external power supply, especially for controllers than can be used as a standalone unit. Manufacturers tend to provide an editor application with their controllers so you can customize things like MIDI mappings, and some also come bundled with a DAW.. Most MIDI pad controllers work with most DAWs yet some are designed to integrate well with a particular DAW. Make sure you read the specifications to ensure any bundled software is compatible with your computer or tablet. Size usually correlates with the number of pads a controller has . If you want something easily portable to connect to your phone, tablet or laptop, then a smaller option with 8 (2 x 4) or 16 (4 x 4) pads would suffice. But if you prefer more functions and pads, most 64 (8 x 8) grid controllers are lightweight enough to carry around when used for live performances. In the end, it depends on where and how are you planning to use your controller. CV stands for Control Voltage. Many old analog synths (and modern recreations of them) use CV as a controller signal in much the same way that modern gear often uses MIDI control or Expression Pedals to control a parameter - usually it's to control pitch on a hardware synthesizer. Make sure the specifications of the MIDI pad controller you are interested in has CV output if you want to control this type of hardware. We looked at all the highly rated MIDI Pads available from major online American retailers and short-listed 19 of them for further analysis. We then gathered ratings and reviews from retailers, forums, YouTube and blogs and major music gear publications. A total of more than 4,100 sources were then fed into the Gearank Algorithm to produce the customer satisfaction ratings out of 100 that we call Gearank ratings. Finally, we selected the highest rated options to recommend above and also used the information we collected to provide the reports above about what users and experts liked and didn't like about each one we recommended. For more information about this process see How Gearank Works. Submitted by Jason Horton on Apr. 15, 2019.